Sustainability is a buzzword in today’s society, and Emory University is a national leader among college campuses. However, arriving on campus and seeing a compost bin for the first time can be a little daunting for some first-year students. Being unaware of its toll, new students often take the elevator up and down when they could use the stairs in their dorm instead. While I am thrilled that I have joined this community and enjoy being part of the sustainability movement, some first-years might feel a little overwhelmed. It is very important to educate students so they can understand and appreciate the sustainability initiatives on campus. I learned more about the program and Emory’s future goals from Kelly O’Day Weisinger, a coordinator with Emory’s Office of Sustainability, who presented on the university’s Climate Action Plan. Emory’s first strategic plan in 2005 enacted steps to decrease energy and water use, and reduce carbon emissions and landfill waste. Even with those efforts, the reality today is that Emory still has a relatively large carbon footprint (~354,762 metric tons CO2 per year). Luckily, Emory’s footprint has stayed fairly constant over the past few years despite increases in campus square footage and a growing student population. Changes in transportation—for example, shuttle buses that run on biofuels produced on campus—helped a lot, decreasing emissions 3% from 2005 to 2010. 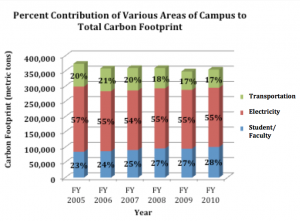 Purchased electricity is responsible for the largest portion of Emory’s footprint totaling 55% of emissions in 2010. A lot of this is unfortunately because Georgia Power runs off coal and natural gas. The graph shows emissions from power are declining, but decreasing energy consumption continues to be a large issue on campus. I believe that pursuing alternative energy sources would be a great way to help achieve that goal. One suggestion is more power obtained from solar energy by expanding facilities on campus. What is the most surprising part of Emory’s profile? The source of emissions that unfortunately increases annually is the contribution by students and faculty. Commuting, travel, and landfill waste are big examples of direct impacts that we have on Emory’s carbon footprint. A new Climate Action Plan established last year with the help of students and faculty has set major goals towards reducing Emory’s impact on the environment, projecting a 20% reduction in overall carbon emissions by 2020 and shooting for 50% by 2050. Specific goals include reducing energy use by 50% per square foot, sourcing 75% of food locally or from sustainable means, and diverting 95% of wastes from landfills. One of the things that stands out to me is how accessible sustainability is on campus. Through a combination of research, teaching, and community outreach, the Office of Sustainability Initiatives works to address issues that are within everyone’s reach. Students and faculty who have been at Emory for a while are pretty experienced on how to incorporate sustainable practices into their lives. However, one area that could use improvement is communication with the first-year class, especially considering that students come from such different experiences and not everyone knows about sustainable living.